The Hang Seng Index closed more than 3 percent lower yesterday, dragged down by Hong Kong-listed mainland firms as concerns for a weaker yuan increase, amid global uncertainties. 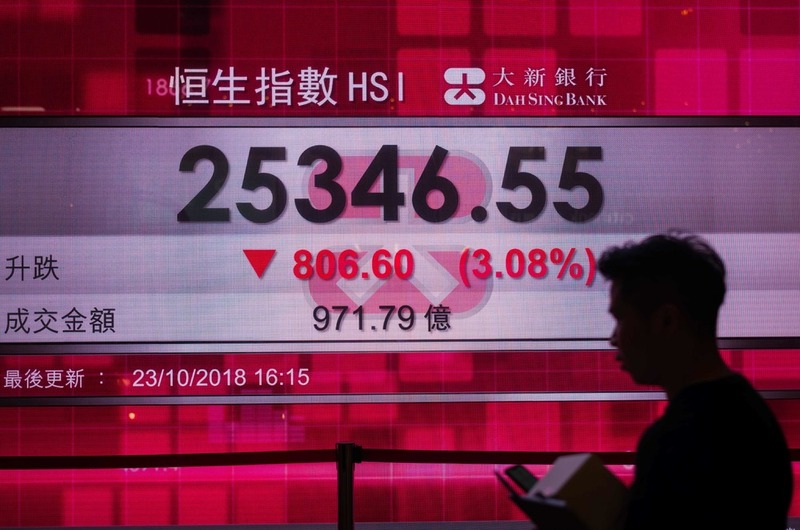 The Hong Kong benchmark index fell 806 points to 25,346 points, while Asian markets also fell as sentiment was affected by concerns about Saudi Arabia's diplomatic isolation and fresh worries about trade wars. The HSI added 2.3 percent on Monday as the Chinese government voiced support to the stock markets, however. "Investors have digested the news around the policy support," said Ben Kwong, head of research at KGI Asia. "Their focus is turning to what's happening in global markets, earnings of Hong Kong-listed companies and news around US-China relations," he said. In Hong Kong, the index for mainland companies once lost as much as 3 percent before ending the day down 2.44 percent. Concerns about yuan weakness also weighed on the share prices of Hong Kong-listed mainland firms and helped to drag down the market. "A lot of the companies here are Chinese companies, their profits are in yuan but their shares are sold in Hong Kong dollars," said Patrick Yiu, managing director at CASH Asset Management. China's main stock indexes resumed a downward spiral, a day after the blue-chip index posted its biggest gains in nearly three years, as investors remained pessimistic about economic prospects and risks posed by shares pledged for loans. At the close, the CSI300 index was down 2.66 percent. The Shanghai Composite index lost 2.26 percent. The CSI300 has lost 7.4 percent this month, and the Shanghai index is down 8 percent. Messages of support from central government officials on the weekend - aimed at easing concerns over risks posed by 4.3 trillion yuan (HK$4.86 trillion) worth of shares pledged for loans - helped China's markets to rally on Monday, driving the CSI300 to its strongest day since November 2015. But yesterday enthusiasm had disappeared among both onshore and offshore investors. "There was a big turnaround on Friday, when the authorities came out to save the market," said Steven Leung, sales director at UOB Kay Hian. "But ultimately, foreign investors didn't buy this story." The Nikkei share average fell yesterday, with all but a handful of the index's constituents in the red as subdued corporate earnings and a pullback in global equities weighed on investor sentiment in Japan. The Nikkei was down 2.67 percent at 22,010.78, handing back Monday's modest gains. The Dow was down more than 400 points at the opening.